Faster than Titan X at a much lower price, with a GTX 1080 price cut for good measure. Rumors about the GTX 1080 Ti have been circulating for months. The product was inevitable, but looking at recent history, the 780 Ti came out six months after the 780 and nine months after the original GTX Titan, and the 980 Ti was launched nine months after the 980 and three months after the Titan X. Perhaps more importantly, 780 Ti came out right before AMD's R9 290X launch, and the 980 Ti was released right before AMD's Fury X. It's no secret that AMD is prepping to launch its new Vega GPUs, with a Q2'17 release date. AMD's Capsaicin event is also happening today, which means while I've been sitting in Nvidia's presentations I had to miss AMD's announcements. To say that competition between the two main GPU vendors is fierce only begins to scratch the surface. Nvidia has the lion's share of the dedicated GPU market, and it's not about to sit idly by waiting for AMD. And so, once more, Nvidia is debuting a new Ti part, the GTX 1080 Ti, preempting Vega by a couple of months. Both the GTX 1080 Ti and Titan XP use the same GP102 core, which has up to 3,840 CUDA cores, and both GPUs disable two clusters (256 CUDA cores), giving 3.584 CUDA cores. More interestingly, The Titan XP has 12GB of 10Gbps GDDR5X, while the 1080 Ti blazes a new trail and ships with 11GB of 11Gbps GDDR5X. Yes, you read that correctly: Nvidia has cranked the dial on 1080 Ti all the way to 11. Nvidia gets the 11GB figure and 352-bit memory bus by disabling one of the 32-bit memory channels on GP102, but makes up for the deficit with higher clocks. For the GPU clocks, Nvidia hasn't given us exact numbers, only a typical boost clock of 1.6GHz. That will probably be some weird number like 1607MHz, and we don't know the base clock, but overall compute is definitely higher than Titan X. Nvidia has also improved the cooling, and says overclocking to 2GHz or more on the stock cooling is possible. What can you expect in terms of performance? 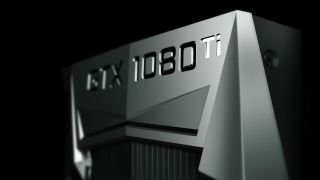 In terms of raw compute and memory bandwidth, the 1080 Ti actually rates higher than the Titan XP, with eight percent more compute and one percent more bandwidth. While there's technically a bit less memory, it's doubtful that we'll see many games during the lifetime of the cards where the 1080 Ti and Titan XP really differ. Nvidia also gave a preview of 1080 Ti performance and says that on average (in demanding graphics workloads) the Ti will be 35 percent faster than a GTX 1080. That's a pretty massive jump in performance, much more than most were expecting. To understand how GP102 ends up at the final specs, a few other pieces of information are in order. First, the original GDDR5X memory could clock at up to 10Gbps, but going higher resulted in more interference and noise. Over the past year, manufacturing of GDDR5X has improved and the result is that 11Gbps is now attainable. Related to this, Nvidia also announced that there will be new overclocked versions of the GTX 1080 and 1060 6GB, with the memory running at 11Gbps and 9Gbps, respectively (1Gbps faster than 'stock'). Availability for the new parts wasn't provided, but these appear to be a spring refresh of the existing cards. GTX 1070 apparently gets left out, at least as an official OC part, but don't be surprised if some companies do 9Gbps 1070 cards at some point. Nvidia also revealed some details on its tiled caching architecture, a secret sauce that has been present in its GPUs since the Maxwell architecture. On average it improves effective memory bandwidth by about 30 percent. Combined with compression technologies, the effective memory bandwidth of the 1080 Ti is substantially higher than the raw 484GB/s figure. Nvidia has also reworked some of the power delivery system for the 1080 Ti, improving efficiency. The 1080 was already quite a bit better than the GTX 980, and by using 2x dualFET (compared to the 1080's single dualFET mechanism), the 1080 Ti is a few percent more efficient at higher clocks. The big news isn't just the announcement and specs of the GTX 1080 Ti, it's about retail pricing and availability as well. Where the Titan X is a $1,200 card that's only available directly from Nvidia or through select system vendors, the GTX 1080 Ti will ship through all of the usual Nvidia graphics card partners— Asus, EVGA, Gigabyte, MSI, PNY, Zotac, and others. That means more competition, custom cooling solutions, and more variation in pricing. The 1080 Ti will come in both Founders Edition models as well as custom designs, with the initial cards all being Founders Editions. In a change of tune from the 1080/1070/1060, however, the Founders Edition has the same MSRP as the custom cards. For the launch, the 1080 Ti MSRP is $699, taking the spot formerly occupied by the GTX 1080 Founders Edition. Damn! Nvidia also announced a price cut on the GTX 1080, dropping to $499 from the current $599 MSRP. It's not clear if the Founders Edition also drops to this price, but that would make sense considering the 1080 Ti pricing. I'd also expect a price drop on GTX 1070, but Nvidia didn't announce any changes. GTX 1080 Ti should be a gaming powerhouse, designed for people that want to play 1440p 144Hz or 4K 60Hz, or even one of the upcoming 4K 120/144Hz HDR displays. If you've been holding onto an older GPU like the 780 Ti, waiting for the next high-end-but-not-Titan graphics card, it's now here. Or you can wait and see what AMD's Vega has to offer when it launches. Reading into the specs a bit, I think Nvidia may feel AMD's Vega is going to be a potent GPU, and its response is to release a 1080 Ti that packs more of a punch than expected, and at a lower price as well. Before the announcement, many were guessing a price of $800-$900, and 1080 Ti easily beats those guesses. Nvidia has now set the bar for Vega to clear. The obvious question is which GPU will be faster, more efficient, and/or better. And the equally obvious answer is that I can't say for sure without testing the hardware. AMD's Polaris 10 GPU (RX 480) is roughly comparable to Nvidia's GP106 (GTX 1060), with GP106 on average delivering slightly higher performance while using 20 percent less power. RX Vega and the 1080 Ti may follow that trend, or Vega could improve AMD's GPU efficiency. Pricing is also a factor, but I don't expect Vega to cost much less than the 1080 Ti (though AMD hasn't revealed any official numbers, so that's just a hunch). As usual, it's shaping up to be another brutal head-to-head between AMD and Nvidia GPUs. Unlike last year's Polaris vs. Pascal, this year AMD has a high-end alternative on tap, and hopefully that means better prices for everyone. I don't have hardware in hand just yet, with an embargo on benchmark data set for "next week," so it will another busy week of testing. I expect 20-40 percent faster performance than the 1080, depending on the game and settings, but that will mostly be at higher resolutions. Users of 1080p monitors can probably sit this one out.